WITH THIS CLEANER you can easily remove water spots. These are, for example, caused by condensation on the sensor. The cleaning solution has a high cleaning power. THE SOLUTION IS alcohol free and contain no toxic or combustible additives. THE SENSOR CLEANER is suitable for Swabs (Swab) and works safely and effectively. 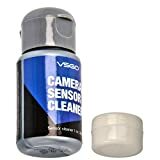 Thus, this set facilitates professional cleaning of your camera and sensor. and contains no toxic or combustible additives. It is particularly gentle and leaves no smearing. provides a professional cleaning your camera and sensor. Especially valuable for smear-free cleaning. This entry was posted in Discount Photography and tagged 30ml, Camera, Cleaner, CMOS, DDS3, DSLR, Sensor, Special, VSGO by Ball Photo. Bookmark the permalink.